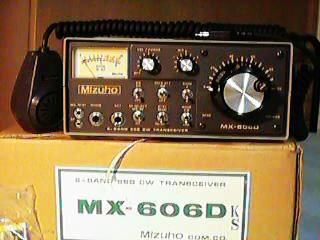 The MX-606D was Mizuho's one and only 6 meter SSB/CW base station. Manufactured beginning in 1986 and produced throught the late '80s, the MX-606D is clearly based on the MX-6S handheld transceiver design and the and matching PL-6S 10W amplifier, but they are integrated together into a single radio in one bigger box. The optional CW-6D, which provides sidetone and QSK CW operation, is like a CW-2S on a board that mounts inside the radio. The controls are much larger, of course, and tuning isn't nearly as course as in a handheld. Output is 10W. One big improvement over the handheld VXO design is that each crystal covers a full 100kHz of the band instead of 50kHz. They are exactly the same crystals used in the MX-6S, but instead of stretching 50kHz up from the derived base frequency of the rock, they stretch 50kHz in both directions. A typical rig might be crystalled to cover 50.100-50.200 in the A position and 50.200- 50.300 in the B position. The rig uses the same MS-1 speaker/mic. as an MX-6S would, but a front panel switch allows you to choose between the internal radio speaker and the speaker in the MS-1. A quarter inch phono jack is also provided for headphones or an external speaker.